Heroin is classified as an opioid drug because it acts on the opioid receptors in the brain. The drug is mostly used recreationally to produce euphoria in the user and also results in relaxation, drowsiness, and reduces any pain experienced by the individual. Chronic pain caused by terminal illnesses and end-stage cancer. Maintenance therapy for those who are addicted to heroin, even being considered more useful than methadone. This is somewhat of a controversial use of the drug though. Does heroin cause have any adverse effects? Contracting blood-borne diseases such as hepatitis and HIV due to sharing infected needles and syringes to administer the drug intravenously (into the bloodstream through a vein). Developing fungal or bacterial endocarditis (infection of the inner lining of the heart). Formation of abscesses at the injection sites due to the introduction of harmful bacteria into the soft tissue when injecting the drug. Accidentally becoming poisoned with products used to “cut” the drug. Overdosing on the drug which can suppress the central nervous and respiratory systems enough to result in death. Heroin is an extremely addictive drug because of the way it works on the brain. The mentioned opioid receptors are involved in the reward system of the brain and when they are stimulated, the result is a relaxed state, or a “high”, that makes the user feel pleasant. Frequent and regular use of heroin leads to tolerance to the drug which means the individual needs to use more of the product to reach its desired effect. Dependence develops when stopping the drug causes withdrawal symptoms such as restlessness, agitation, cold flashes, nausea and vomiting, diarrhea, muscles aches and pains, insomnia, and severe cravings for heroin. This results in the continued use of the drug to avoid these symptoms from occurring. 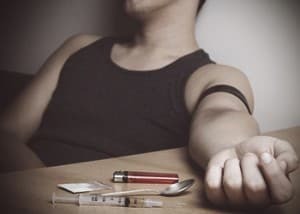 Continued use of heroin then leads to issues such as health-related problems, failure to meet responsibilities at school or work, and even getting into trouble with the law. This is termed as the user having a substance use disorder and the most severe form of it being referred to as an addiction to the drug. The collapse of veins that are used to inject the drug into. Sleep disturbances that are difficult to manage. Damage to the mucous membranes in the noses of those who snort the drug. Damage to the valves of the heart due to endocarditis. Liver and kidney disease usually caused by the additives in the drug. Development or worsening of mental health disorders such as depression. Irregular menstrual cycles in women.